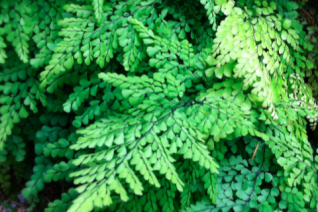 Cool hybrid between two California native maidenhair ferns that we love because its EVERGREEN! Finely divided soft green leaflets surprise as they sail through the toughest winter with little or no damage. A clumping variety that slowly increases over time in rich, moisture-retentive soil in part shade to shade. Adores moisture but can go much drier than most maidenhairs. To 10″ tall and as wide – then increasing. Lovely thing that works in woodlands to containers. Excellent naturally-occurring hybrid that deserves a place in our gardens. Moderate deer resistance. 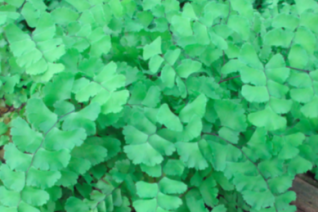 Himalayan Maidenhair fern is one of our favorite groundcovers for shade and rich, moist soil. 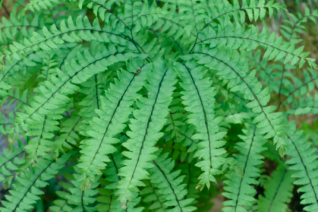 The divided fronds in the shape of an arrow are always soft and fresh. In spring this deciduous variety emerges with tones of amber and soft pink before taking on a mature soft green hue. These delicate leaflets are held on thin, wiry black stems to 10″ tall and it spreads prodigiously to form vast colonies. It doesn’t smother neighboring plants however, instead it seems to just flow around such woodland neighbors as Epimedium, Hellebores, even woodland bulbs like Erythronium. Regular summer water. Avoid hard, compacted dry soils. High deer resistance.